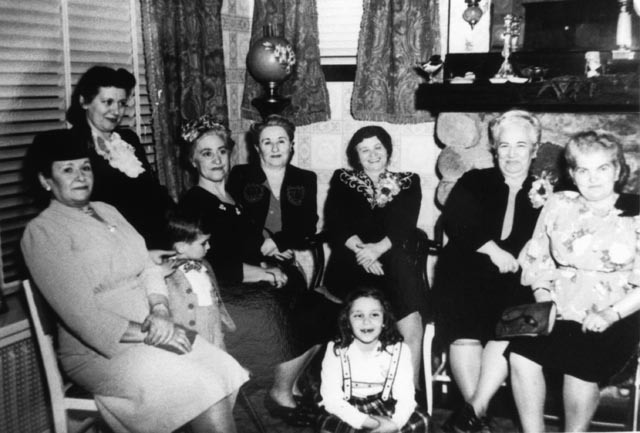 Gittel Goldman, born circa 1888, and Yocheved (Etta) Goldman, born July 1, 1896 in Zvil, were the daughters of the famous Hasidic rabbi, Yechiel Michel Goldman and his wife Miriam Sura Rabinowitz. Yechiel Michel was a direct descendant of the Ba’al Shem Tov, and be­lieved to be descended from King David. 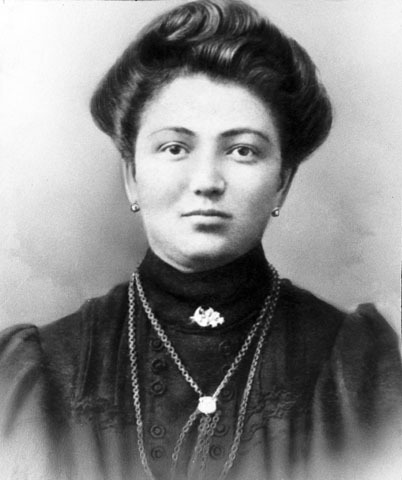 Miriam Sura Rabinowitz was also descended from a long line of rabbis. 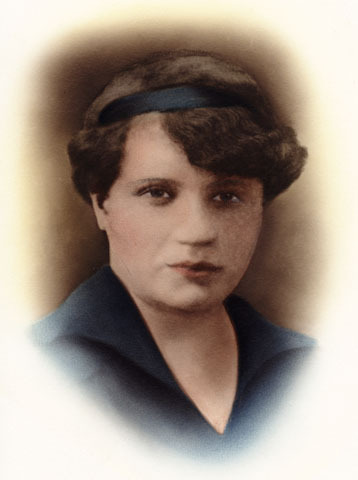 Gittel and Etta had two brothers, Josef Yitchak Goldman, born 1891, and David Efim Goldman, born 1900. Little else is known about Gittel Goldman except that her children remembered (or recalled hearing) that she was very intelligent. Only one photograph of her is in existence. 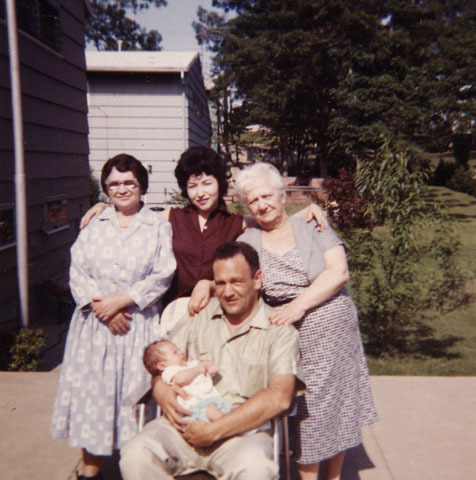 “Etta was a very old-fashioned Yiddishe mother, devoted to her children and home. She came from a very religious upbringing and was proud that she was the wife of a grand rabbi. She had, however, been interested in another man before her sister died but she knew she was expected to marry her sister’s husband. The other relationship didn’t work out. “I think my parents loved each other at the time they got married. When they were older I can remember them talking and my mother would suddenly burst out laughing because she found something amusing. However, they never demonstrated any affection for each other in front of the children. This was part of their culture. “My parents spoke Yiddish in the home but spoke well enough in broken English to communicate with shopkeepers. My brother Sam would accompany my father if he had to go to a doctor. “My mother did not have a social life except in connection with the synagogue attached to our house. Women would come to visit her at our home but she never went to their houses. This was quite a status issue. Women came to her. “My mother wanted my sisters and me to marry and be happy. She was after all of us from the age of 16 or 18 to get married. That was her only expectation for us. “My mother had live-in help a woman who helped with the cooking and housekeeping chores, plus for holidays she had extra help. 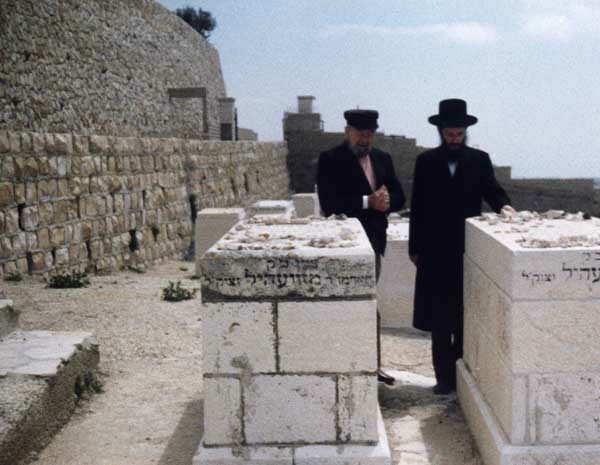 Traditionally, Jewish men and women were buried in separate areas in a cemetery. Since Etta could not share Jacob’s ohel, her children decided to honor her memory by burying her in Jerusalem. Her stepson Baruch (left) and ? visiting her grave. 1926-1966 U.S. District Court Boston Naturalizations Index, admitted 7 Dec 1953; Petition #316795 ; U.S. District Court Boston; National Archives, New England Region, Trapelo Rd, Waltham, MA. Witnesses: Barney Gittleman and Aron Baru. Etta lists her marriage date as June 1921, but her husband listed it as May 1921 in his naturalization papers. Interview with Rabbi Baruch Korff, 133 Brown Street, Providence, Rhode Island 02912) by Carole G. Vogel, 14 January 1993. Transcript held in 2004 by Paul Gass of Gloucester, Massachusetts. 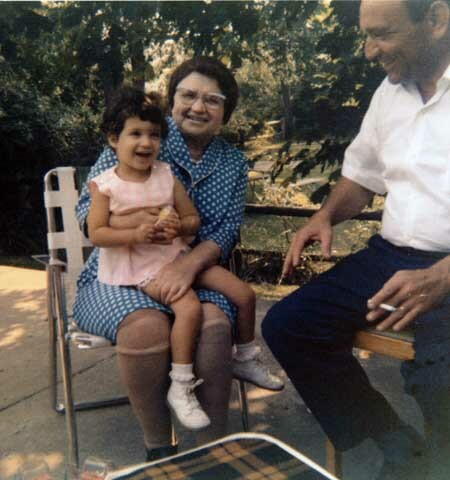 Phone interview with Betty Korff Berkowitz by Carole G. Vogel, July 23, 2004. Transcript held in 2004 by Paul Gass of Gloucester, Massachusetts.